This Bestar computer desk will be a stunning focal point in your contemporary home office. Its stylish red finish brings a touch of flair to any room or office. Crafted from sturdy manufactured wood, it's sure to support your work space for years to come. Designed to keep you compact and organized, this desk is perfect for storing a computer and notebooks. Add a touch of modern flair to your home office or study space with this expanding desk. The dark, red cocoa finish and silver-toned hardware enhance modern appeal. Quality craftsmanship and high-grade materials are responsible for the unique gliding system and solid structure. Deep open-shelves and drawers make up two cabinets anchoring the desk onto metal gliders; these gliders ensure smooth sliding to expand and contract this desk. Available in dark cherry with silver-toned hardware. 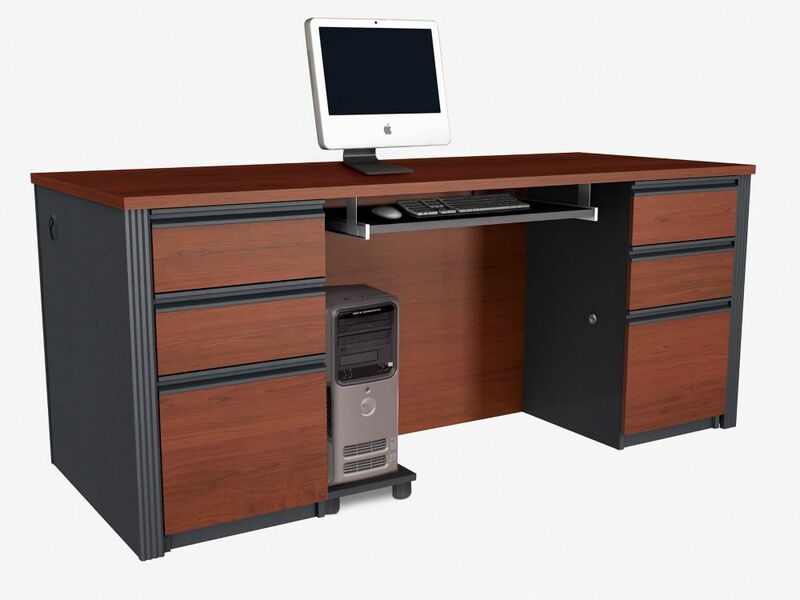 The Clifton Computer Desk is an efficient and secure workstation that fits well in small spaces.The generous desk surface is made from laminate with a raised top shelf for your monitor and a lower bottom shelf for your hard-drive and other supplies. The desk has a modern silver, powder coated frame finish and a perforated lower frame design. Self-leveling floor glides keep your desk from wobbling on uneven floor surfaces and protect your floors by sliding smoothly when you need to move the desk.The efficient Clifton desk has a modern design that works well for both writing projects and computer work. This corner style computer desk will be a stunning focal point in your contemporary home office. This simple and stylish compact work station features thick panels and clean lines in a crisp white finish. The writing desk offers a spacious work surface that is great for doing paperwork or working on your computer. The secondary surface can conveniently be assembled on the left or right hand side. It offers additional work space with extra shelves (including one adjustable shelf) and one storage drawer with a chic silver coloured plastic handle to keep you organized in style! Space saving and functionality are combined in this rustic industrial style computer desk. It features three storage drawers that can be assembled on the left or right hand side, accented with bold black metal handles, and includes a file drawer to hang standard or legal sized documents. The smooth desk top has enough space for a laptop, a lamp, and accessories to keep it all within each reach. Finished in a contemporary two tone black and grey wood-look, this modern computer desk will be a stand out in a home office, student dorm, or anywhere in your home. Prestige + 71.1-inch x 30.4-inch x 29.8-inch Standard Computer Desk in Red This Bestar computer desk will be a stunning focal point in your contemporary home office. Its stylish red finish brings a touch of flair to any room or office. Crafted from sturdy manufactured wood, it's sure to support your work space for years to come. Designed to keep you compact and organized, this desk is perfect for storing a computer and notebooks.